The day I went to Whole Foods to buy the quinoa for my Quinoa Salad with Pistachios and Dried Apricots, I was passing by the meat department and noticed some samples sitting up on the counter. I cannot resist samples, so I helped myself to a little red-hued meatball with a toothpick sticking out the top. I took a bite as I started walking off and was stopped dead in my tracks. It was so amazing I turned right around, and after looking around to see if anyone was watching, snagged another meatball. I had to buy some of this what-ever-it-was, so with the appearance of the guy behind the counter, I asked what it was and where I could find it. He said it was Mulay’s Chorizo, and lucky for me, he had only one package left, which was back in his walk-in frig. I have had chorizo in the past, but the kind in a casing, I think it was Spanish, and the bulk from Bristol Farms, which really didn’t do that much for me. 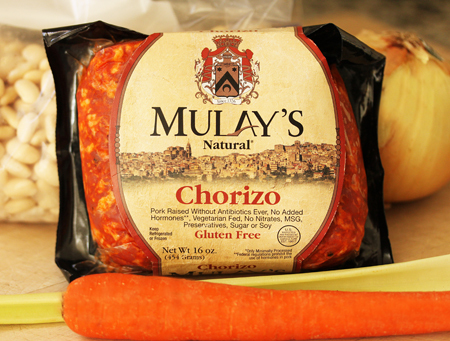 The ingredients on the Mulay’s label are pork, water, salt, paprika, spices & garlic powder. It wasn’t over the top spicy, just enough to make you want to eat this stuff every day for the rest of your life. So if you are a chorizo aficionado you will want to try this. If it isn’t available in your neighborhood, you can mail order it from Mulay’s. It’s a family owned company and their website is quite interesting, where you can find a lot more recipes using chorizo and other sausages. I also like the idea that they use pork raised without antibiotics ever, no added hormones, vegetarian fed, no nitrates, MSG, preservatives, sugar or soy. Well, don’t I sound like an advertisement. LOL. So I went home and had to figure out what to make with this chorizo gold I had discovered. I decided on White Bean Soup, and I’m glad I did. The chorizo flavored the broth with its spicy smoky flavor and made me really happy. I made a big pot and froze it in serving-size containers, so each time I made it I experimented with toppings. I tried grated mozzarella with a sprinkle of minced Italian parsley, which was good. But the dollops of salty, crumbly Queso Fresco cheese with minced cilantro and basil sprinkled over the top was the best. If you don’t have Queso Fresco, you could use a dollop of ricotta sprinkled liberally with kosher salt and ground black pepper. I think you could add shrimp or leftover fish broken into pieces. Have fun. Get creative. 1. Place the dry beans in a large pot and cover with water 3 inches above beans. Soak over night or up to 24 hours. Drain and rinse thoroughly before using. 2. In a large pot or Dutch oven, cook the chorizo without browning, breaking it up into little pieces. 3. Push the chorizo to the side of the pot and add the onion, carrot and celery. Cook until the onion is translucent but not browned. 4. Add the 1 cup water, chicken broth, diced tomatoes with their juice, bay leaves, parsley and the drained white beans. Bring to a boil, lower heat and simmer (barely boiling) for 1 hour, uncovered. Stir occasionally. Skim off any froth that accumulates on the surface. 5. Add 1½ cups water, bring back to a simmer and cook for 1 more hour, until the beans are soft. Continue to stir occasionally. 6. If the beans are not done, add ½ cup more water and cook for an additional 15 minutes. 7. When the beans are done to your satisfaction, adjust the level of liquid and add up to ½ cup more water. Adjust the seasoning with kosher salt and pepper. 8. 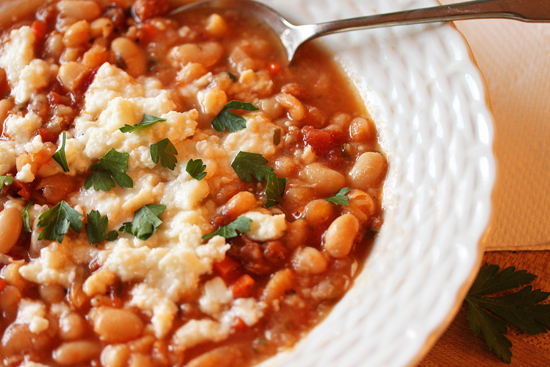 To serve, ladle soup into warm soup bowls and top with dollops of Queso Fresco cheese and minced herbs. Note: If you freeze it in serving-size containers, add ¼ – 1/3 cup water or chicken broth per serving when reheating in the microwave. Lynne, You have to stop cooking beans, they are by far my favorites and I can not resist, except that we already had a Lynne meal this week and I need to make something for my blog. 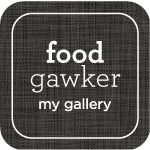 How can I do that when I want to recreate your amazing dishes? P.S. Where in the world can you find Pomegranate Molasses? Dear Polwig, Thank you so much for your kind words. I’m so glad you like my recipes and I really appreciate your comments. You make me smile a lot. As I recall, I bought the Pomegranate Molasses in a Middle Eastern Market. Maybe you could find it on-line. Lynn, perfect use (finally) for the piece of chorizo sitting in my fridge! Thanks! I usually cut the chorizo into “coins” & saute them with finely minced onion and garlic until they get that brown “stickiness” on them, then add a can of chick peas (juice and all – not drained) & scrape up all the good bits and mix well & heat thru. Serve over plain white rice… yum! 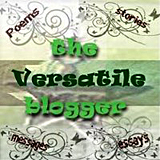 I’ve never seen beans so great looking as these.. reading your post has made me crave for them lovely site. Such a delicious soup! Now if only it was a bit cooler right now in Texas. We love our chorizo here! Thank you so much for sharing yourself with me tonight. I’m about to go to sleep and I consider it a pleasure to end my “internet day” with a visit to your site. Much love from Austin! This soup looks and sounds wonderful! I love the addition of queso fresco on top. This is almost embarrassing, but in all honesty – Is chorizo a brand or a type of meat? Chorizo is a type of pork sausage originating in Spain and Portugal. It can be fresh, or cured and smoked. It gets its red color from dried smoked red peppers. Mexican chorizo is usually made with chili peppers. In Spain and Portugal the sausages are stuffed in casings from intestines. Mexican chorizo may be in casings or ground bulk, without casings. Hope this answers your question. Thanks for stopping by. And come back soon! Thank you so much for the amazing endorsement of Mulay’s Sausage! It makes our day when we find fans like you. We have shared your recipe on our new blog (http://www.mulayssausage.com/blog/chorizo-white-bean-soup-with-queso-fresco) and hope others will enjoy it, too! Ultimately, this was a delicious Autumn soup for a cold night. I did have to make some additions to increase the flavor – 1) added a can of pureed tomatoes, along with the diced; 2) added 2 tsp. of Adobo seasoning; 3) added the remnants of a package of taco seasoning; 4) added 3 cloves of minced garlic along with the onions; 5) added a 1/3 c. of chopped red bell pepper; and 6) stirred in 1/3 c. sour cream after taking the pot off the burner. Truthfully, I didn’t find that the beans’ flavor or texture warranted all the time spent soaking and simmering. 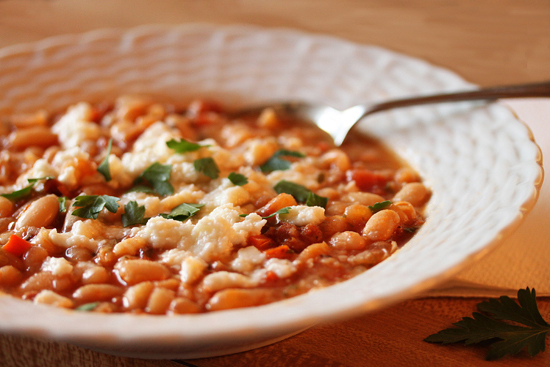 Next time, I’ll used 2 cans of white beans to make this an easy weeknight recipe.